Toy Fair is just around the corner and that means a whole lot of reveals and exclusives being shared with the Metal Media Command HQ. Aggronautix’s Throbblehead line is celebrating its 10th year of these Punk Rock Polyresins and the latest one is presented below for your observation. Take a look. RANCID’s “Skeletim” mascot has been transformed into a Throbblehead! This figure is limited to just 1000 hand-numbered units, stands at 7″ tall, and is made of a high quality polyresin. Skeletim is rocking a studded leather jacket, oxblood docs, and a classic sunburst mohawk. Rancid and the Dropkick Murphy’s are co-headlining the From Boston To Berkeley Tour and will be joined by Bouncing Souls. 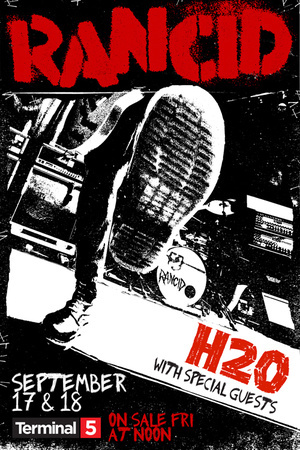 Rancid will perform their brand of Ska-Punk for two nights at T5 with H20 as support. Lace up those boots for one or both of these appearances.